As if the song “Let It Go” from the hit movie “Frozen” couldn’t get any bigger, with countless performances, renditions and parodies, you can now credit it with helping a child calm down in an emergency. Firefighters belted out the tune to comfort a little girl after she became stuck in an elevator. 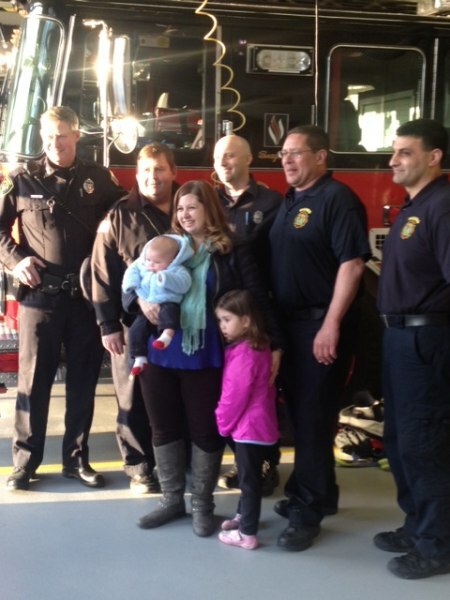 Kristin Kerr, with her kids Jackson and Kaelyn, poses with Reading, Mass., firefighters. Scott Myette, third from the left in the back row, and John Keough, right, sang "Let It Go" to Kaelyn during the elevator rescue. “It was easily one of the cutest things I’ve ever seen in my life,” her mother, Kristin Kerr, told TODAY Moms. The ordeal happened last Wednesday in Reading, Mass., as Kerr her two kids—4-year-old Kaelyn and 3-month-old Jackson — headed to a hair appointment for her daughter. The salon was on the second story of a building, so the family took an elevator, which suddenly stopped moving just as they were about to reach their destination. Firefighters were called to the scene and when they couldn’t get the lift to budge, they lowered a ladder down into the open shaft elevator to get the family out. They carried out the baby without any problems, but Kaelyn was very nervous, said firefighter Scott Myette. “Just as my daughter was about to go up the ladder, she pretty much froze and said, ‘No way, I’m not going up the ladder,’” Kerr recalled. So firefighter John Keough started talking to the girl. Both he and Myette have young kids and “Frozen” is big in their worlds. Myette’s daughter is “absolutely obsessed” with the movie’s theme song, “Let It Go,” he said. To improve the impromptu performance, Myette also played the original song, which he had downloaded on his phone for his daughter. 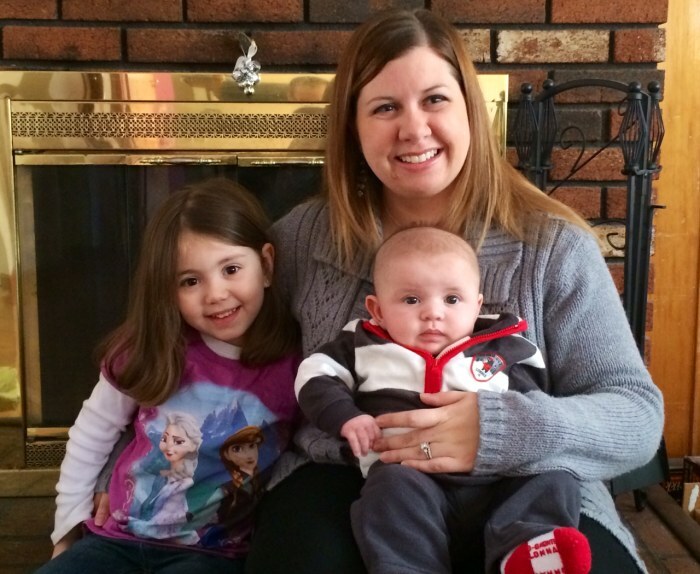 Kristin Kerr relaxes with her daughter Kaelyn, 4, and son Jackson, who is 3 months old. Kerr said her daughter loves both the song and the movie, which she estimates she’s watched 15 to 20 times. She was both amused and impressed by the firefighters serenading her daughter. “I think she just kind of saw a different side of us. Maybe we weren’t so scary,” Myette said. Kaelyn was so unfazed, in fact, that she insisted to go on with her hair appointment.